Sofia Samatar is a Somali-American writer, poet and professor. She published her first novel, A Stranger in Olondria with Small Beer Press in 2013, and in 2016 published its sequel, The Winged Histories. Her work has also appeared in such publications as Tin House, Gigantic Sequins, Apex Magazine, Lightspeed, Strange World and Uncanny Magazine. With unyielding precision and mastery, Samatar stitches together a patchwork of incongruities, each as sinister and incandescently beautiful as the one that comes before it. Sifting through the collection is akin to teetering on the edge of a precipice and breathing in something foul, yet sacred; rotten, yet divine. The reader emerges with the sensation of having gone on a very long journey, without ever having taken a single step. For her excellence in writing, Sofia Samatar has received the William L. Crawford Award, the John W. Campbell Award, the British Fantasy Award, and the World Fantasy Award. She teaches literature at the James Madison University in Virginia. Maddie King: “The Hunchback’s Mother,” “Ogres of East Africa,” “How I met the ghoul”—your bibliography was already chock-full of monsters and misfits prior to Portraits. What attracts you so to them, and has it been a life-long attraction? Sofia Samatar: Yes, it’s been lifelong, and it doesn’t seem to be decreasing! As for why—this is one of the questions I ask myself in Monster Portraits. Why should it be that there were two kids on our block—my brother and myself—who kept the love of monsters after they grew up? I never came up with a singular answer to that question. Instead, Monster Portraits afforded me the space to turn it around and play with it, to explore what a monster—a creature that fits no known category—might mean to people like us, to people who combine so-called different races, different ethnicities, different histories. And then to extend beyond that, and ask what monsters might mean to everyone, since we’re all combinations, all irreducible, all ultimately uncategorizable. 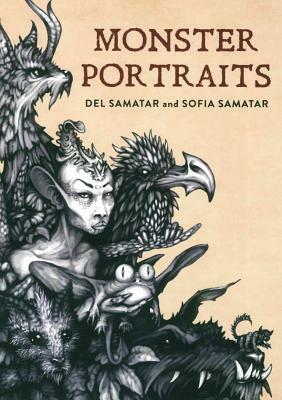 MK: Monster Portraits is part fiction, part memoir, part research—it incorporates as much reality as it does fantasy. In “Monsters of the Fairy Kingdom” you cast writing as parasitic and lecherous. Can you tell me a bit more about what thoughts or experiences inspired a story that asserts that “to live for ideas, that’s not an acceptable life?” (40) How do you create symbiosis between your life and your art? What ethics, if any are involved? SS: There are several references to parasitism in the book—a relationship that we often think of as creepy and disgusting, but which actually characterizes life as a whole. In “Monsters of the Fairy Kingdom,” I was thinking about one of those elements of the book you mention: the research part. I love research and quoting other authors. But Monster Portraits is so full of quotes, it sometimes feels patched together, like Frankenstein’s creature. There are times you can see the seams. I knew that this was the right form for the book, but in “Fairy Kingdom” I let myself feel the anxiety of it. How disorienting it can feel to realize you’re a patchwork of quotations. This idea of a kind of dread of quotation—a dread of what is the source of life for me, as a writer—then led into a larger question of the artist as parasite, a creature that feeds on life without actually living. In fact, I don’t believe in this figure! I don’t really think artists are like that, but they can appear that way to a capitalist culture that privileges utility and production. Art is so wonderfully, dazzlingly, breathtakingly useless. So in that piece, I was letting myself feel the mournfulness of it, the sadness of being a kind of tick on the back of civilization. But really, secretly, I think that uselessness is brilliant and radical. The idea of becoming a bug is scary, but the bug-like creatures in Monster Portraits aren’t scared. They’re hungry, active, alive. MK: In “The Clan of the Claw,” you assert that: “monsters combine things that ought not to go together.” It does seem as though, like your monsters, your narratives are composite creatures. Bloom promotes authors who have published after what some might consider “past prime,” while Rose Metal Press seeks out masters of the hybrid writing, i.e. work that resists unambiguous classification. Both promote the unconventional, which begs the question: how have you defied the conventional? Was hybrid writing ever for you its own kind of strange new beast to pursue? SS: Every piece of writing is a strange new beast! I do tend to gravitate toward experiments with narrative, simply because I get exasperated with conventional, linear storytelling—although I also find that compelling and keep going back to it. My relationship to form is a dance, you could say, or a succession of moods. I don’t see it as defiant, necessarily, but rather unstable or flickering—unpredictable. In the end, I find that every work of writing presents new problems, whether it’s more in line with the traditional or something totally bizarre. That’s why I say they’re all strange new beasts! I never feel like an “accomplished” writer, I never know what I’m doing, I’m always starting over from scratch. I do love the work Bloom is doing. There’s something exciting and liberating about the middle-aged debut. It’s a bit monstrous, actually—I’m thinking of one definition of the grotesque, as a collapse of time. The scholar Geoffrey Harpham says one way of producing a grotesque figure is to mash different parts of the life cycle together, to make a giant baby or a combination of a tadpole and a fully-formed frog. So a Bloom writer, as a person who’s both “new” and “late,” is a bit grotesque. But that’s exactly where ideas spring free. That’s what the grotesque is for—to turn things topsy-turvy, to bust the categories open, to make space. MK: Your work stems from very personal seeds—namely, your ancestry and childhood, which you share with Del, your brother and the visual artist behind Monster Portraits. Tell us about your partnership with him—the highs and lows. Did the images come in the wake of previous collaboration? SS: No, we’d never collaborated before. Well, that’s not entirely true. We wrote a book about a dragon together when I was nine. And we used to make up stories when I was in middle school, based on our vague notions of Dungeons & Dragons (we didn’t actually have the game). But as grownups, no. But I’d always known that this was something I wanted to do, if I could ever get published—I wanted to do a book with Del, because his work is so amazing. We started talking about it after my first novel came out. As for the process—I wish I had some fiery tales of artistic differences here, but I don’t! He made the images, I wrote to them, that was all. It was harmonious, but never boring—like a very small utopia. I suppose the best answer I can give is that I hope Monster Portraits acts as a dwelling, a temporary shelter, for those who cannot dwell. MK: In “The Scribes” you reference a “zone of incandescence” in which writing was, as in childhood, “fluid” akin to “taking dictation.” I wondered if instead of fluidity, you might have embraced incongruity—a brush befitting the portrait. Normally, I would favor questions about content over style, but I’m so in love with your use of italics, parentheses, capitalizing, paragraphing, etc…I feel as though they contribute to the highly visual quality of this collection, as well as its content. Does form play into the ideological backbone of the book? SS: For me, fluidity and incongruity go together. It’s in the most open and flowing moments of writing, when I’m “in the zone,” so to speak, that I’m most likely to write incongruous things, to surprise myself. So I wouldn’t think of embracing incongruity “instead of” fluidity, since for me they’re part of the same experience. The “zone of incandescence” is one of my favorite quotes in the book, and one I think about a lot. It comes from Aimé Césaire, who experimented with surrealism and sought in his poetry a kind of unreason, or beyond-reason—a glow. This was in deliberate opposition to what he saw as the murderous, deadening reason of Western colonial empires (which might speak to what you call the “ideological backbone”). I really love his idea of poetry as a zone of incandescence, a radiant space for the liberation of thought and language. As for italics and capitalization—I approached them so randomly at first, completely by feel! But then when the book went through the editing process, my editors pointed out that this was confusing, so we tried to impose some order on it—putting quotations from other authors in italics, for example. The spacing remains pretty intuitive. There are spaces where I sensed a new thought starting, or a new action or element, and there are spaces around ideas or images I wanted to isolate, to lend them weight. MK: Your Monster Portraits takes the form of an expedition into unknown territory. Some of your faraway lands sound unheard of, such as Vlost, and Carvay—others are more familiar. We get glimpses of locations: cities, hotels, an office, a bridge…whether real or imagined, defined or ambiguous, place plays a key role in your writing. There is an added kinesthetic quality to the way you transition from one ‘dialect’ to another: at once you speak like a scholar, others, a poet. Your narrative voice seemingly moves and absorbs faster than pen can be put to paper. What sort of physical and mental spaces do you inhabit when producing a body of work as expansive as this? Is there literal travel involved? SS: During the writing of Monster Portraits, I relocated twice—from Wisconsin to California and then from California to Virginia. Perhaps all this travel got into the book somehow, but if so, I wasn’t conscious of it. The journalist in the book is exploring monstrous, fantastical regions, places that could be reached from inside a locked room. Those imaginative spaces are the important ones, for me. They’re made of experience, literature, and dreams: a combination of places I’ve been to, things I’ve read, and visions that occur to me at random. The changing voice, which creates those spaces, really has to do with my reading material, I think, because while writing the book I was reading both scholarship and poetry. That’s probably my favorite grotesque combination. MK: You started out as an English-language instructor abroad, and now you teach African and Arabic literature as well as speculative fiction at the college level. How has this aspect of your life and career filtered into your creative work? Were there significant moments and/or exchanges that marked you as a writer? SS: Teaching literature is a wonderful way to study writing. I love seeing how students interact with texts, both in discussion and in their written responses. I’m interested in which narratives move them, and how. What’s the story or poem that everybody wants to write about, and how are they responding to it? I notice, for example, that many of the young women in my classes are consistently drawn to Charlotte Perkins Gilman’s story, “The Yellow Wallpaper.” This story is over a hundred years old, so the fact that they’re so interested in it is significant in itself (and, of course, it’s disheartening, too, that they find it so recognizable). Perhaps because I emphasize the uncanny in my classes, they often take that direction with the story in their papers. They show me, again and again, and in different, surprising ways, how a mood can be transferred over time, how its power persists. They remind me that something as seemingly fragile as a weird, sickening atmosphere can be seductive, subversive, and unforgettable. Tags: A Stranger in Olondria, Del Samatar, Maddie King, Monster Portraits, Rose Metal Press, Small Beer Press, Sofia Samatar. Bookmark the permalink.